What is your recommended product for 10kΩ, rated power 0.1W, and TCR is 25ppm/K ? In RG series, size is 1608 (1.6mm x 0.8mm), code for TCR is P, code for tolerance is B, then, what you are looking for is: RG1608P-103-B-T5. T5 designates 5000, the quantity in a reel. How part numbers differ in RG series for high precision, standard and high power ? There is no difference in part number for precision, standard or high power. This means even though they are the same products, depending on what voltage your application requires and how it relates to the rated power, you can choose one of the 3 conditions. Note that depending on the condition, maximum resistance drift rate is different in reliability tests. Please be sure you verify the reliability specification. Is quantity in a reel expressed in the part number? What is the unit of the packing ? The quantity in a reel is expressed in the last 2 digits of the part number. However, it can change depending on product series and product size. Please consult each series part numbering system in our catalogue for details. Two element RM has resistance value in its part number. How about 3 element or more ? In 2 element RM, both resistance value are expressed in its part number. If 3 or more, part number designates circuitry type and special code for the custom part. Refer to RM series part numbering system. The standard marking on the chip is a dot and a bar shown as ① below. If custom code is added, it would be like ②． Contact us for other type of marking. Can E96 series be expressed in 3 digits ? In 1608 size, it is so small that it is difficult to mark on the products. In RG series, you can choose "no marking " or "simplified marking". Most users choose no marking. For simplified marking, refer to product technical report in this web site or catalogue. Can we use RG2012 with 1/4W ? You can use it at 1/4W but it is in "high power "condition, and has to be 47Ω or higher. Specified maximum drift could be larger in some of the reliability tests. In RG 2012, what is the difference among 3 groups of rated power, precision, standard and high power ? There is no difference in product part number even though there are 3 power ratings. Because rated power is different, the rated voltage, calculated from rated power, is also different. Reliability specification is also different. For details, please refer to the catalogue. By calculation, rated voltage exceeds element maximum voltage. Can I use it ? What is frequency performance of RG series ? It depends on resistance value and product size. The higher the resistance value, the lower the resistance drift in very high frequency. 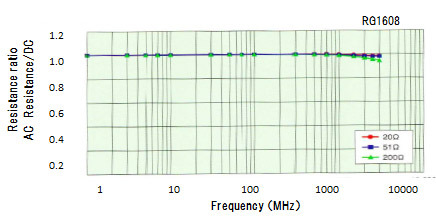 The typical frequency characteristics are shown below. I am looking for the highest rated power product in 3216 size? What do you recommend ? We have two 1W precision 3216 size resisters and one 1.5W low resistance current sensor. The precision resistors are PRG (long side terminal) and HRG (short side terminal) and current sensors are KRL series. We are considering thin film resistors for automotive application. Do you have highly reliable products ? AEC-Q200 compliant RG series offers +/-0.05% tolerance and +/-5ppm/oC TCR. This product's typical drift after 10000 hours of various reliability tests is less than +/-0.1%, extremely reliable. Are there anti-sulfur thin film resistors? Susumu's products do not use any Ag in their terminals. Therefore they do not have any sulfur related issues. In addition, RG series employs inorganic passivation and extremely tolerant to moisture. Please recommend products with very small TCR and minimal drift at high and low temperature ? URG series has +/-1ppm/oC TCR and extremely stable under low and high temperature. How should I read the MRG series' maximum pulse power limit? If the pulse's voltage is over the rated voltage, can the resistor tolerate it ? In the chart showing maximum pulse power limit, X axis is pulse duration. In very short pulse, maximum power exceeds rated power. This means pulse voltage exceeds rated voltage. This maximum power limit is a reference. Please calculate average power and design with some margins. Product technical report lists recommended land patterns for all products. Please refer it. HRG series has higher power than other short side terminal products. Is there anything we should consider when mounting HRG series ? HRG series have larger terminals in order to handle high power. Therefore, the land pattern also should be larger than other same size products. Please use it so that the terminal temperature should not exceed 155 degree(C) giving consideration to the board temperature. Cam we solder chip resistors with solder dipping ? Yes, it is possible . Recommended condition is 10 seconds at 260 degree(C). What is the resistance drift by soldering ? This film products show almost no change at all by soldering. RG series specification is +/-0.05%+0.01Ω. This depend on the products. Please refer to your purchase specification. Is the tape paper or embossed plastic? It depend on the product size. Generally speaking, 2012 or smaller use paper tape and 3216 or larger use embossed tape. Some products use embossed tape for 2012 (ex. RM2012). For details please refer to the product technical report.